Lest you imagine us to be living a glamorous jet set life in London, let me give you a little glimpse into our laundry. No, we don’t have a dryer. We hang dry ALL of our laundry. The funny thing is I’m completely used to it now. 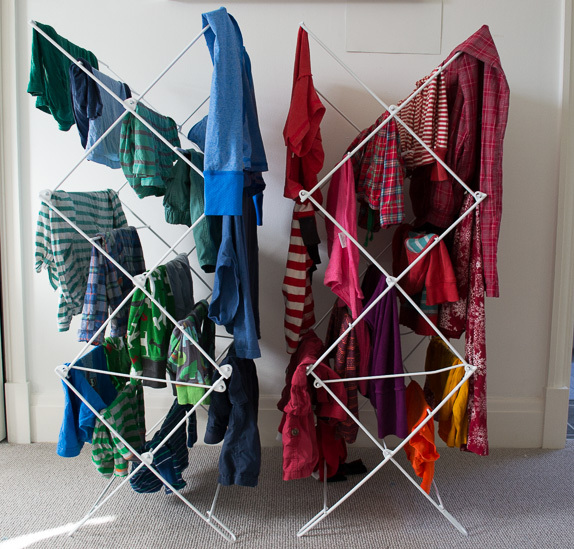 Yes, we ALWAYS have drying racks hanging in our room. And sometimes we have sheets draped down the staircase and over tables and chairs. But they make great forts and think of all the savings on our electric bill. Besides, if we’re really in a pinch, there is a pub across the street from the neighborhood launderette so we can always have a pint while we watch our sheets dry!